Your donuts look wonderful, Kitty. They're very pretty and festive too. It sounds to me like your grandchildren have a lot of fun when they visit you and their uncle. Such cute little faces! That is a pretty teacup and you have some lovely plants. 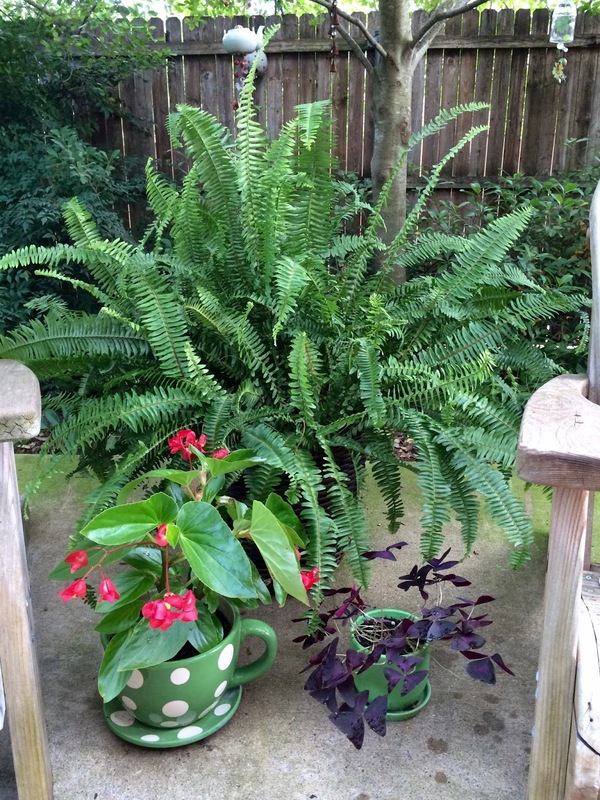 I am especially fond of ferns. I pray your day will be blessed, dear Kitty, as you remember your sweetheart and the wonderful life you had together. Sending you hugs and my love. Nna's Cooking Camp is a major success because of a lot of love!!! Those are blessed grandkids! 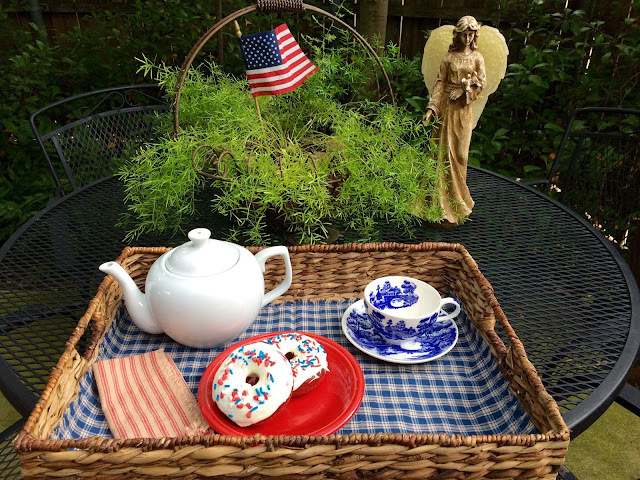 The donuts look delicious and your yard with the teacup planter is so cute! Very festive! I have always loved Lakeview...one of the best Japanese patterns...in my opinion. Well, I know you'll be keepin' busy....Thanks so much for linking to Tuesday Cuppa Tea! I love your Nana's Cooking Camp. I will file that idea away if I am lucky enough to be a grandma some day. We share a wedding anniversary. Today is our 29th. Sending you a big hug on this day. I hope you are comforted by lots of happy memories. How fun to have a Nana's cooking camp day with your grands. 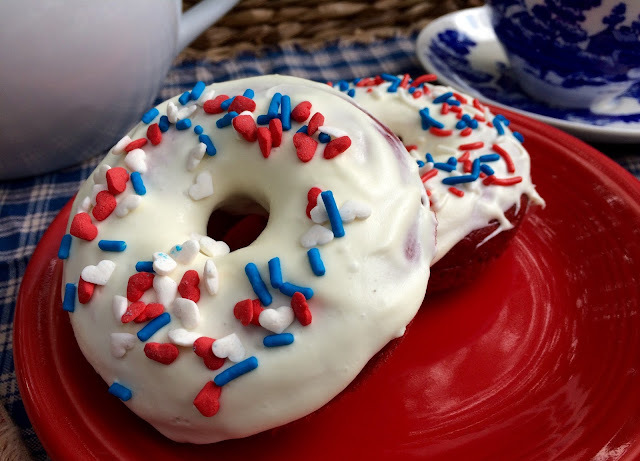 I love the red white and blue donuts and such a pretty table setting too. Thinking of you today and hope you think of lots of happy memories with your Dearest. Oh Kitty, I know how much you miss your dear husband. I'm sure he is so happy that you are carrying on and taking care of your grandchildren in such a special way. I'm sure he is proud of you for the love you are sharing with the family that the two of you created together. We celebrated our 30th anniversary back in February. I simply cannot imagine life without my dear husband, so I can guess how difficult this day is for you. I am sending loving thoughts your way. What a joy that you live near enough to your grandchildren to be able to spend these summer hours with them. Hi Kitty, Well I just think cooking camp with you would be fabulous. Your grands are all so cute and looks like they were having a grand time. Thanks for sharing the recipe. Oh how good those donuts look. Love your blue and white tea cup too. I am such a fan of blue and white in anything and have a large collection of it. Your fern and flowers are doing beautifully. I had many flowers winter well this past season too. We just didn't get cold enough and that was good. Happy Anniversary to you. I know your beloved is looking down and smiling upon you. I know how you miss him and I know he lives in your heart forever. Sending hugs and love your way my friend. Aw, Kitty, Happy Anniversary to you. Keep counting, you'll be celebrating together again someday. The donuts and the kids' cooperation can't be beat! Blessings to you Kitty. I know you miss your husband so much. Sending up prayers today for you. How wonderful to have all the grands. Those donuts look great. They did a great job and I bet there were none left. Still thinking about the nice lunch we had Thursday. It was great to meet you. Oh oh oh...red velvet cake is one of my favorites and now to think I can make doughnuts, oh yes! Thank you for sharing it with us, dear Kitty. Your grand children dogs a marvellous job at decorating those doughnuts, and their water colors are delightful. I zoomed in on the photo. Oops!! Did a marvellous job not dogs. Ha! Hooray for the return of Nana's cooking camp! 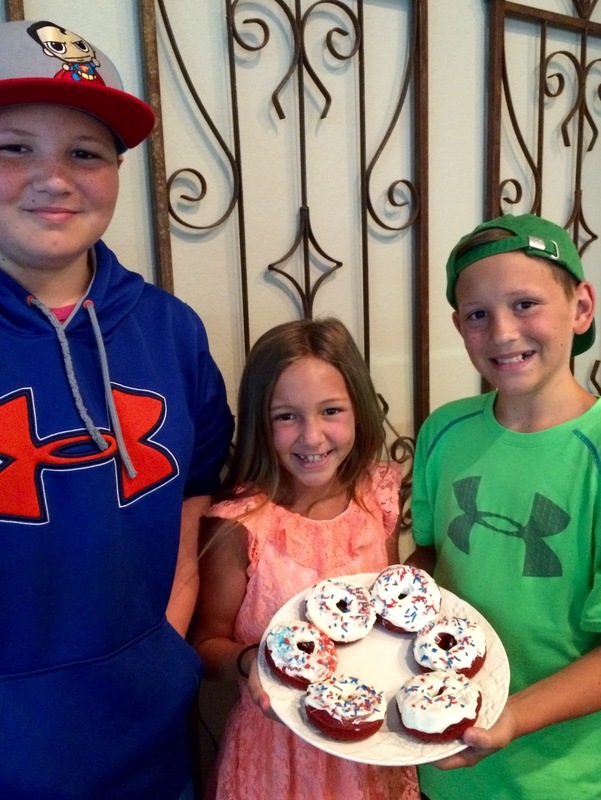 The grandkids did a great job on the red velvet donuts. I also really liked your red, white and blue-themed tea setting and the giant green polkadot teacup planter. Sending you hugs on this special day! Your grands are so darling. I've never made donuts...your patio area looks so peaceful. Yes, I think you should get out those little red cowboy boots! The donuts looks delicious and I like the patriotic decorating scheme. Great fun at Grandma's as usual. Anniversary wishes are still in order as your husband lives on in your heart. A hug for you on this special day. Donuts and kids go hand in hand! We received some donut pans and I haven't made any yet. Your recipe has inspired me to make some for the 4th of July. It doesn't look too complicated. I hope being with family helped a bit on your anniversary day. I think it is sooo wonderful that you are teaching your grandkidlets to cook & bake!! I also wish I'd had someone like your Mike to show me how to paint...what a great asset & the "Uncle Bucks" are hilarious incentive! Those red velvet doughnuts look delicious. How wonderful to be passing down baking skills to your grand children. Looks like you all had fun, such treasured memories your grand children will have of special times spent with their Nana. Thank you for the donut! Yum. Your grandchildren had a brilliant time, and how nice of your son to offer his help! Love the idea of 'Uncle bucks'. My heart was moved to hear its a special and bittersweet day for you, inevitably. How wonderful that your grandchildren come to "camp" with you! They all look adorable and happy. The donuts are a success. Your plants are doing well! Mine are struggling this year and I don't know why. Sending you a special hug on this special day. I used to do this with Alex and Abby ~ such fun!! I'm so glad that you have these opportunities with your grands. They are all so cute too! The doughnuts look pretty and sound delicious. I continue vacillating about buying donut pans ~ kinda think it could become an addiction. :) Love the angel! I wish I could soothe your aching heart re: your anniversary. The special dates are a challenge aren't they? Just know that he's smiling down on you and sending love always. Oh what a fun post. I do GiGi's Cooking Camp every Thursday with our Grandson. Mostly we've been doing Bento Box type little snacks. This week we are making pizza. I'd love to try those baked donuts! I want one of those donuts too! Red, white and blue they are - can we all come to cooking camp and join the grands. Great fun here and I thank you for sharing and linking. Wow Kitty, you are amazing and your grandchildren must LOVE your cooking camp lessons. You all did a wonderful job making the donuts. 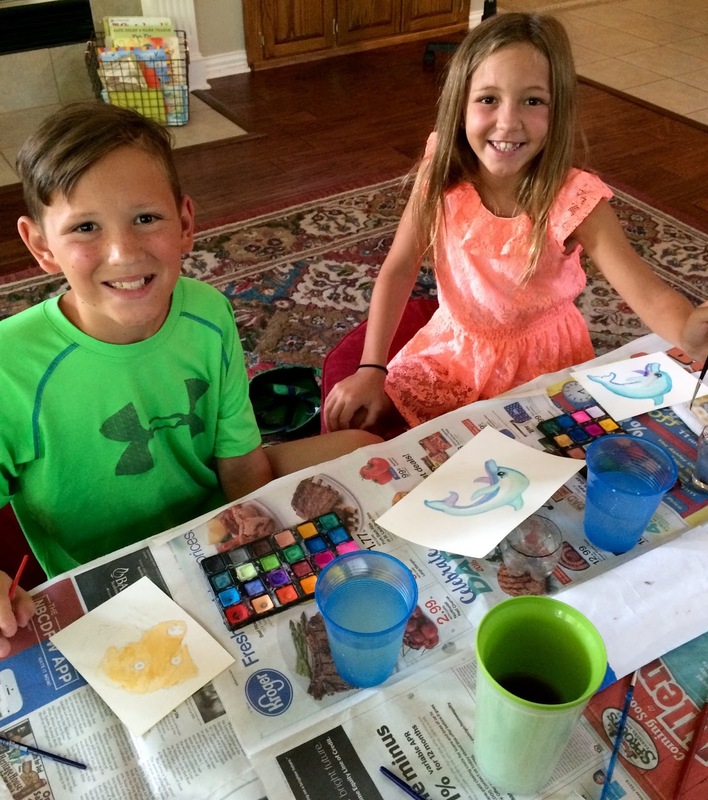 Thanks for sharing at our Cooking and Crafting with J & J. Wishing you a wonderful week and a happy 4th of July. These sound divine Kitty! I know your grandkids had a ball and after all that hard work making doughnuts you deserve a sit down in the garden! Kitty, what a marvelous grandmother you are! And what a wonderful idea to have "Nana's Cooking Camp!" You are making memories that they'll share with their children and grandchildren one day. Your Red Velvet Doughnuts look wonderful with those magic touches from your special grandchildren, they are just precious! We just had Grandma's Summer Camp here at the cottage, and I am looking forward to a nap! Thanks so much for sharing with us at Full Plate Thursday and have a fabulous weekend and come back soon! Nana's cooking camp sounds so fun and the kids did a great job! They look so yummy. You are creating such special memories with your grands Kitty. Thanks for sharing with SYC. Oh the doughnuts look wonderful!! I do cooking classes with my grandchildren too...how fun. it is harder to get them together since they are older...sports, camps, friends etc but I do one each week for whomever can come. I think they will always remember this when they are older. I will have to follow along and get ideas. Hi Kitty! I need to buy a doughnut pan, as your recipe looks so good and easy! I know how special it is to have grandchildren spend time with us! 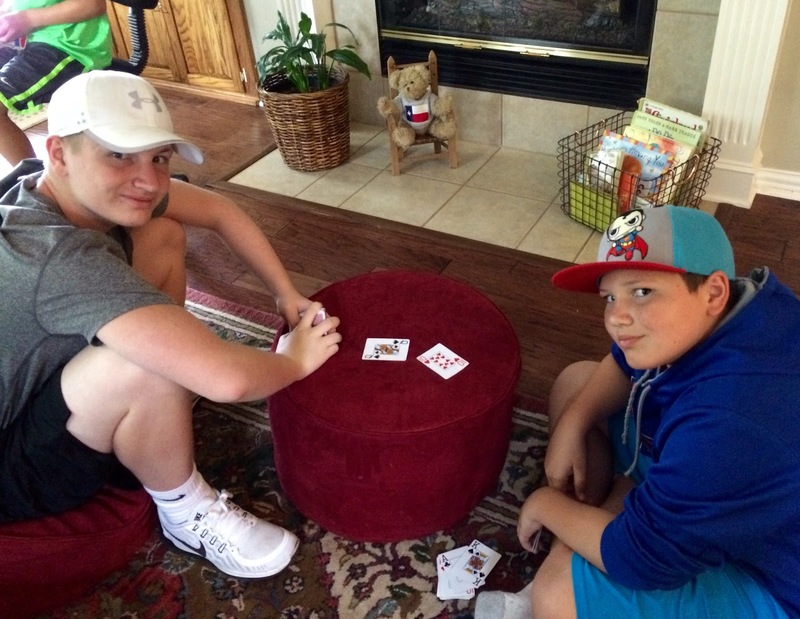 Looks like so much fun for them to spend time with grama! Praying you have a good holiday weekend. I know holidays are especially hard when we miss our loved ones. I have missed you Kitty! Your blog posts always make me smile! Happy Nana Baking Camp! I can hardly wait until my grands are a little older and can bake with me! I have only "baked" donuts twice and they were just okay. I am excited to try a new recipe and yours looks perfect! I will be featuring your post at No Place Like Home this week. Have a wonderful 4th of July, sweet friend! I would love to attend your cooking school! You are such a wonderful grandma. Doughnuts are my fave, although I never had a red velvet one! Kitty, what a fun day. The doughnuts look delicious. I have not made any because I can't be trusted. Things get out of hand quickly if doughnuts are involved. OMG, this is awesome! Wish we had a Nana's day cooking too. Your grandchildren are so handsome and that pretty girl looks so much like you. Happy 4th. of July !! Hi there, I'm visiting from Rose Chintz Cottage. Your doughnuts sounded very good, so here I am. I want to wish you a 'Happy Anniversary' also. Love keeps growing even though our dear husbands are no longer with us. Their being with Jesus gives us peace. What a smile you put on my face talking about Uncle Bucks. It made me think of children's laughter while earning them. So sweet! Your recipe sounds delicious, a must try in my book.